The signs of the time, society heading into the wrong direction. 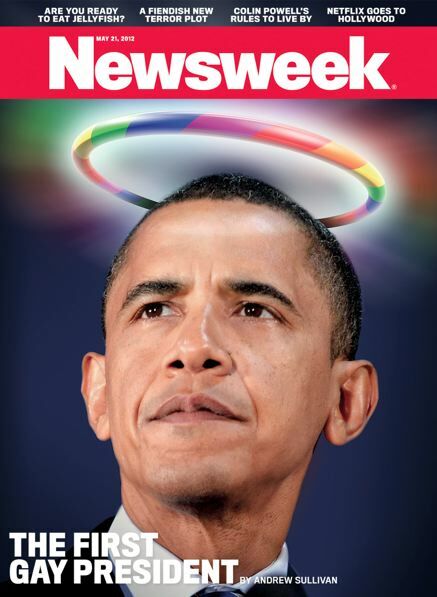 It was not President Obama who chose this picture, but once again the liberal media portrays him as a Saint. I let the Word of God speak for itself. “For the word of God is living and powerful, and sharper than any two-edged sword, piercing even to the division of soul and spirit, and of joints and marrow, and is a discerner of the thoughts and intents of the heart. And there is no creature hidden from His sight, but all things are naked and open to the eyes of Him to whom we must give account.” Hebrew 4:12, 13. “For the wrath of God is revealed from heaven against all ungodliness and unrighteousness of men, who suppress the truth in unrighteousness, because what may be known of God is manifest in them, for God has shown it to them.” Romans 1:18, 19. For this reason God gave them up to vile passions. For even their women exchanged the natural use for what is against nature. Likewise also the men, leaving the natural use of the woman, burned in their lust for one another, men with men committing what is shameful, and receiving in themselves the penalty of their error which was due. And even as they did not like to retain God in their knowledge, God gave them over to a debased mind, to do those things which are not fitting; being filled with all unrighteousness, sexual immorality, wickedness, covetousness, maliciousness; full of envy, murder, strife, deceit, evil-mindedness; they are whisperers, backbiters, haters of God, violent, proud, boasters, inventors of evil things, disobedient to parents, undiscerning, untrustworthy, unloving, unforgiving, unmerciful; who, knowing the righteous judgment of God, that those who practice such things are deserving of death, not only do the same but also approve of those who practice them.” Romans 1:24-32. “Do you not know that the unrighteous will not inherit the kingdom of God? Do not be deceived. Neither fornicators, nor idolaters, nor adulterers, nor homosexuals, nor sodomites, nor thieves, nor covetous, nor drunkards, nor revilers, nor extortioners will inherit the kingdom of God.” 1 Corinthians 6:9-10. “Now the works of the flesh are evident, which are: adultery, fornication, uncleanness, lewdness, idolatry, sorcery, hatred, contentions, jealousies, outbursts of wrath, selfish ambitions, dissensions, heresies, envy, murders, drunkenness, revelries, and the like; of which I tell you beforehand, just as I also told [you] in time past, that those who practice such things will not inherit the kingdom of God.” Galatians 5:19-21. “Woe to those who call evil good, and good evil; Who put darkness for light, and light for darkness; Who put bitter for sweet, and sweet for bitter!” Isaiah 5:20. Hey Freddy…you’ve been such a blessing and so helpful to me. Your site is anointed, and filled with helpful information. I nominated you for this award! Please follow the directions here http://lynleahz.com/2012/06/29/reader-appreciation-award/ Thank you so much for everything you have done, and God bless you. Oops….the tickling ears, I mean! Ahh, yes..the tickle in the ears indeed! And there are so many lukewarm these days, more than ever. It’s going to be hard work, but God’s people need to come to life and get out and shout it from the street corners that Jesus is real, and the day is near; time is short, repent!! We need to be like John the Baptist in a sense. It is very sad. Many people will fall away from the true faith because of their itching ears. Just as the Bible teaches, lukewarm Christians that follow the doctrine of men. Yes, I am very aware of it..infact, it is the inspiration for my first book in the Martyrdom Series, Soul Deceiver, My concern is that many people besides you and I do not know about it. I can’t tell you how many people look at me blankly when I ask them about it. This deeply greives me that people are not watching the signs as they should; and how many of them, not knowing, will be led astray by this religion? It recently got bigger; you are aware of what happened on June 26th of 2011, as I believe I commented here on? And I can’t name the names for legal reasons, but let’s say that many of our trusted ministers were involved and in agreement. Very sad. Hi Lyn, yes the word Chrislam has made it to California, it’s been going on for a while. Some of the denominational churches have embraced that movement. Be awake, be aware! I’m kind of curious, because it is my understanding that Obama is a supporter of this religious movement–Chrislam–how many people really know about it? It is the most widespread in Michigan at this time, but it is growing quickly. This is a perfect example of the faith of a child. I believed God told me to do something, I didn’t take the time to think to myself, “Is it really God? How am I going to do this? But I can’t!” I just did it because God said it. I didn’t stumble around in my words, or worry what these people would think of me. Now, there is a fine line between numerology and what I am talking about here. God does use numbers for things. All throughout the Bible, He uses 7, 4, 6, and so forth. For example, 7 is the number of Christ. The number 4 is the number for the bride of Christ, the church. Six is the number of man and is associated with Satan and sinfulness. But this number continued popping up in my life; from looking at the clock at that time, to seeing in the background on something on the television, to addresses and file numbers. Anything you can think of, the number 714 happened. As the years progressed, I was going to a Spirit filled church and all of a sudden, they spent months on 2 Chronicles 7:14. The Holy Spirit said to me, “That’s it! That’s what it means!” So, I knew it meant this verse, but I didn’t know what it meant for me until many years later. As a matter of fact, I was stunned. In my second book, which is not yet published but will be soon, the emphasis is the tribulation period, and it focuses on 2 Chronicles 7:14. God tells the main character in my book, Khalid, to name the church, who’s address number is 714, church of Second Chronicles, and to place it’s name above the address number, 714. He told Khalid that this was His message for the world; infact, there is mention of this verse in my first book as well. Months after writing this, I was reading the book, “The Harbinger,” by Jonathan Cahn. I was instantly covered in goose flesh and blown away when I read the same message at the end of the novel….that the message for ‘America’ today is 2 Chronicles 7:14! I’m hearing this more and more. God’s Word is living! The same things that were prophesied over Israel for that time are also prophesied for a nation that was blessed beyond measure because it was founded on Godly principles; a nation that has now turned its back on God and rejected Him. A nation who denies God altogether and is absorbed in ‘self’—America. The call to repentance is strong; is whatever you’re doing worth it? What price will you pay for the things you’re living in? The BIble is clear, and we can try to conform His truth in order to justify the things we are doing; but the word does not change. You can argue it, dissect it, and do whatever you want; but Jesus specifcally says to pick up your cross and carry it. In other words, give up things that are ungodly; it will hurt and you may suffer, but do it. He says, “If you love Me, keep My commandments!” God’s word specifically says that all idolaters, fornicators, adulterers, and so forth shall have their place in the lake which burns with fire and brimstone. His Word also says that not everyone who says, “Lord, Lord,” shall enter the kingdom of God. This is one of the reasons that it is so hard for people these days to really be loyal and faithful to God; they love what they know, and they don’t think about it, but they don’t really love Him. Do you remember a relationship you’ve been in; how infatuated you were at first. That person was all you thought about, all you dreamed about; you ate, drank, and slept nothing but that person. You couldln’t wait to see them, you were anxious to hear their voice; my God, you’d drive for miles on little sleep just to even hope to see them for even a moment. The last thing you would do is hurt the person, say or do anything which might tarnish their opinion of you; you’re very careful to show them your best in every way. You’re anxious to please them and to be the absolute best in their eyes. In a healthy relationship, as the years go by, you enter into something even better, deeper, and stronger…love. Once you understand, truly, that love is not feeling, you begin to realize what it really is. Love involves feelings, but the substance of love is God. God is love. Secondly, love is commitment, devotion, sacrifice, effort, truth, respect, service, faith, hope, and so much more. Just as people do in human relationships, they do with God. They focus on feelings, and when they don’t feel something, they quickly look for something new. When a person gets saved, or something dramatic happens in their life, they’re on fire for God; but as the days progress, it’s back to the same old routine. Have you fallen in love, truly, with the Lord? Do you think about Him constantly, talk to Him on the heavenly phone (prayer), rush to get home from work to spend time with Him, and do you live to please Him? If you answer no to most of these questions, maybe you need to sit down and have that relationship talk with Him. Be honest with Him; He already knows your heart, He’s just waiting for you to talk with Him about it. Infact, start talking with Him, not just to Him. Are you being quiet in His presence, listening for His voice….that still small voice…in your spirit? Are you giving Him much time at all? Did you know the only reason we live is to please Him? That’s our purpose. So if you’re spending most of your time pleasing yourself instead, or pleasing your boss at work, etc. you are not fulfilling your life’s purpose. You were made to seve Him; not the other way around. Your ultimate appointment in this life was to live for Him, to be fisherman of men, and to actually enjoy living for Him. When you truly love Him, you will. To sum everything up, because I realize this is getting quite long, do you happen to hear the warning message floating around in your head from the old childhood game of hide and seek? Little did we know that old game was so prophetic, because the Lord is shouting it right now to the world! I ask people all of the time if they have heard of Chrislam..and they always say no. On June 26 of 2011, 26 leaders from different nations, as well as 20 well known religious leaders met and read the Bible alongside the Quran. They agreed on a new religion, uniting Christianity and Islam together as one…Chrislam. Christians believe this is the emergence of the one world religion the Bible prophecies right before the great snatching away of the church. To unite Christianity and Islam is apostasy. Christians believe in Jesus Christ, the Son of Yahweh; while Muslims believe Jesus Christ was a prophet who God removed from the cross and replaced Him with another person. People, I’m telling you…the call to repentance is strong, and there isn’t much time left before we hear the trumpet blow! Are you sure you’re ready? Those of us who call ourselves saved, are we truly saved? In other words, are we still living like the world, in blatant and outright disobedience to God? The Bible says that not everyone who cries, “Lord Lord” shall enter the Kingdom of Heaven. If you are living in outright disobedience and sin toward God, I encourage you to repent today. Repentance means you admit your sin(s) to God, and then you ask Him to forgive you. It does not mean you’ll never mess up, we will, because we are in a body of flesh. What it means is that you are turning away from that sin and no longer living in it..and if/when you mess up, you confess it immediately and truly allow God’s healing power, through His Holy Spirit, through Jesus Christ His Son to move in you. Realize you need God and call upon Him. Salvation is a commitment, not a free ticket to heaven. True salvation is loving the Lord our God and seekng to please Him; and when we do not please Him, we feel guilty and ashamed, and therefore go to Him and confess this thing before Him. Again, I say, we do not continue LIVING IN IT. I must make that distinction here. I don’t mean to imply that if you sin, you’re not saved…then no one would go to heaven. What I am implying is that if you live in it, knowingly, and you do not desire for God to change your heart, then you may be surprised when the trumpet blows and you’re still standing there wondering why you were left behind. Pingback: Did Jesus have a Facebook Page?